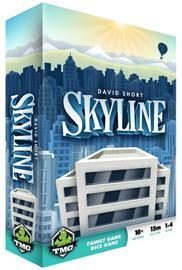 Skyline is a quick push your luck dice game involving set collection. Unlike other dice games that provide no relationship from turn to turn and no player interaction, this game allows players to literally build upon their decisions each turn and react to their opponents' actions. Each turn, players choose to roll dice from either the Construction Yard or the Abandoned District, with the goal of erecting urban buildings. Buildings are made up of three types of dice, Ground Floor dice, Mid Floor dice and Penthouse dice. Some buildings are safer to build but provide little reward, while other buildings have poor probabilities but can have substantial impact on the success of a player's skyline. After rolling their selected dice, the player must use at least one of these dice to take one of three possible actions, Abandon, Build, or Cancel Construction. The Build action is the desired outcome, of course, but can be carried out only if the die result matches what they need to build. For instance, all Ground Floor dice can be built without restriction, but a High Rise Mid Floor die result can be built only on top of a High Rise Ground Floor die. Likewise, a Mid Rise Penthouse die can be built only on a Mid Rise Mid Floor die. If the rolled results do not allow them to Build, then the player must Cancel Construction on one of their existing buildings. If a player does not want to Cancel Construction, then they must Abandon by placing that die in the Abandoned District, which gives their opponents the opportunity to capitalize on this failure.